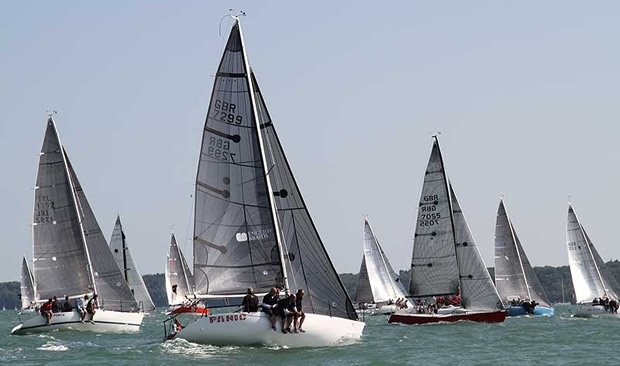 After the high winds disappointment of day one, day two of the Coutts Quarter Ton Cup produced four wonderful races in perfect Solent conditions. The day had opened with light airs and it took a three hour postponement before the sea breeze finally kicked in, but once it arrived the race committee took full advantage of it to run races one to four of the nine race series. From the off the fleet was in spectacular form with closely packed starts, frantic mark roundings and constant place changes on every leg. There were no less than three dead heats on corrected time and multiple photo finishes on the water. From the off Louise Morton and Bullit meant business. At the first weather mark of the regatta they came in on starboard neck and neck with Richard Fleck's Per Elisa, who approached on port. Per Elisa attempted to tack in in front of Bullit but hit the mark and was forced to spin out and do turns. Per Elisa's crew are so well drilled that they completed their turns quick smart and still rounded the spreader mark in second place. Behind them Rickard Melander's Alice II rounded well down in the pack, but was determined not to stay there and soon began moving their way through the fleet. On the line Bullit took the chequered flag with Alice II second, Per Elisa third and Sam Laidlaw's Aguila fourth. After a lacklustre 12th place in race one, Tony Hayward's Blackfun found her feet in race two to lead the fleet from start to finish. Bullit chased her all the way around the track, but on the line it was Blackfun's race by a mere eight seconds from Bullit, with Alice II seven seconds back in third and Aguila fourth. Blackfun shone again in race three winning by a margin of 21 seconds from Magnum Evolution, with Bullit third and Coutt's Quarter Ton Cup newcomer Rob Mclean sailing Spider Pig fourth. Blackfun's form didn't hold for the fourth race though and she finished in eighth, while Bullit claimed her second victory by a mere three seconds from Aguila with Per Elisa third. Fourth place was a corrected time dead heat between Magnum Evolution and Alice II. The racing throughout the fleet has been fabulous to watch. The boats are so evenly matched that even second weather mark rounding are still full of drama and excitement for the spectators. Revival Quarter Ton Class founder Peter Morton, who has won the regatta no less than four times in three different boats, finds himself struggling for traction this year. Sailing the 1989 Fauroux designed Tiger, winner of the Corinthian Coutts Quarter Ton Cup in 2011 and 2012, Peter was never out of the top ten, but his 5, 7, 8, 9 scoreline puts him down in fifth place overall. But the racing is only part of the story of the Quarter Ton Class, the boats themselves are the stars of the show and they hold a special place in the hearts of their owners. Even when they change hands there are often touching stories that bind each boat's owners together. Making their first appearance at a Coutts Quarter Ton Cup this year are Mike and Ben Daly sailing Cobh Pirate, which was purchased from Dominic and Jason Losty earlier this year. Under Dominic and Jason's ownership the boat was known as Illes Pitiuses, but although they were delighted to sell the boat to Mike and Ben, they wanted to retain the name. And so the hunt for a new name was on. Dominic and Jason are both well known Irish Rugby players and it just so happens that Mike Daly's father, Jack Daly, was an Irish International rugby player and grand slam winner who played for Cobh Pirates Rugby Club, the same club that Dominic and Jason played for, so Cobh Pirates it is. The Coutts Quarter Ton Cup is famous for its 'special' prizes and today's bottle of Rum Jungle Rum goes without doubt to Rob Mclean's Spider Pig. They are also Quarter Ton Cup newcomers and were on a rapid learning curve. They opened with a 17th in race one, moved up to 11th in race two and then really hit their form with a fourth in race three. Sadly their run of lack came to an end in race four when they lost their rig and were forced to retire. Tonight every effort is being made to get them back on the water tomorrow. Tomorrow's final day will be a busy one for the fleet. Five races remain to be sailed although in reality a first start time of 11.00 and a final start time cut off of 14.30 unless there is a general recall or postponement during the starting sequence make that a hard goal to achieve. The forecast is indicating south easterly winds of 10 to 18 knots so hopes are high of an onetime start and race officer Rob Lamb has confirmed that he will run as many of the remaining races as time permits. The single discard will be introduced once six races have been sailed.